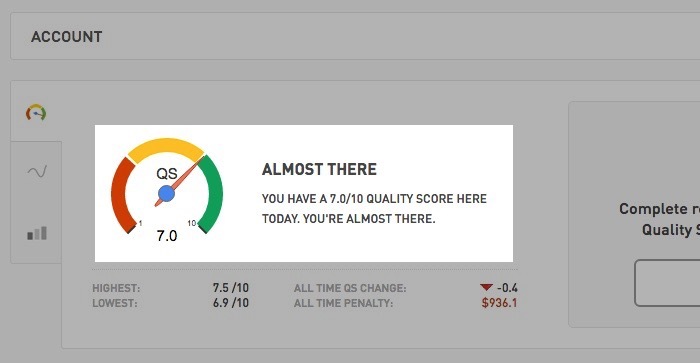 In Adwords, quality score is available only at the keyword level. Tenscores computes those keyword-level quality scores and averages them out to provide them at the ad group, campaign and account level. The averages aren't simple averages, they are impression-weighted averages. Meaning that keywords with more impressions have more importance in calculating the average quality scores. A regular average quality score for this ad group would be 7/10, but it would be misleading as the first keyword is more important due to the volume of its impressions, and the second is almost insignificant even though it has a perfect score. That's why we use the weighted average computation below. The impression weighted quality score for this ad group would thus be 4.5/10 . This gives you an accurate overview of the overall health of your account.